Chile, the world's longest north-to-south nation, is a narrow country bounded on the east by the magnificent Andes mountain range, whose peaks thrust skyward well over 6500 meters. Dozens of active volcanoes smolder and erupt as tremendous tectonic forces trigger constant earthquakes. Nestled aloft in the mountains is Ojos del Salado, known as the highest lake on earth, at an altitude of 6390m. The Andes quickly descend westward, down to the Pacific Ocean, where the vast Chilean coastline extends 6435 kilometers long, across 38 degrees of latitude and beckons the adventurous diver. The quickest route to diving in Chile is to fly into the capital city of Santiago and take a bus or taxi to the bustling port city of Valparaiso, a ninety minute drive away. Prior to the opening of Panama Canal in 1914, Valparaiso was the most important seaport along the west coast of South America because nearly all the world’s east to west shipping traffic was forced to sail around the southern tip of South American continent. Doing so required an arduous journey through the narrow Strait of Magellan or around Cape Horn, an often hazardous shipping route due to high swells, strong currents, fierce winds, icebergs and even rogue waves that reach 30m. After such a long, daunting voyage, a stopover at Valparaiso was usually required. Though Valparaiso may now be past its days of glory, the vibrant city is still culturally and politically important as the home of Chile’s National Congress. Tourism plays a significant role in the local economy, as many flock to enjoy Valparaiso and Vina del Mar, its neighbor city to the north. 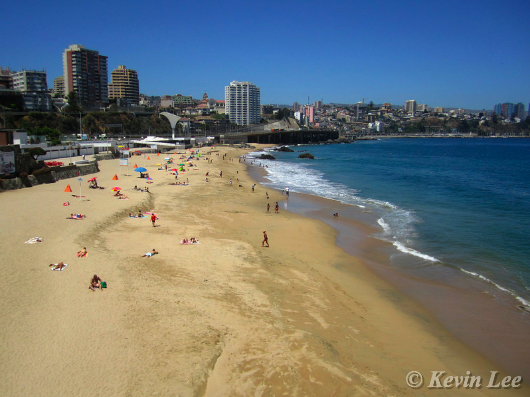 After diving the frosty climes of South Georgia Island, I purposely scheduled a three-day layover in Valparaiso to experience the warmer waters of Chile. Through an internet search I had the good fortune of connecting with a dive operator called ValpoSub (www.valposub.cl). 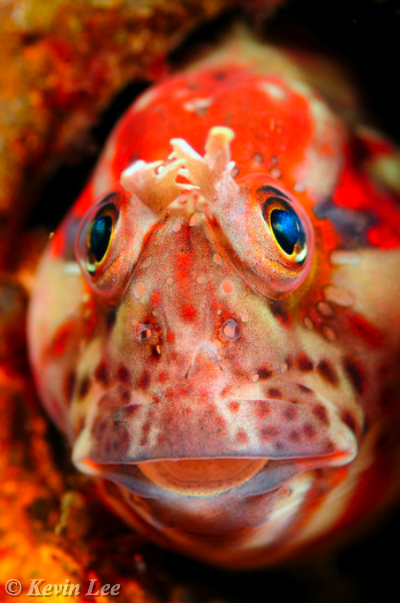 The owner, Ramon Caballero, an engineer by profession, loves scuba diving with a deep passion. He was very friendly and helpful in scheduling two nice days of diving. We geared up, walked down a ramp beside Meulle Baron Pier, and strode into the water. 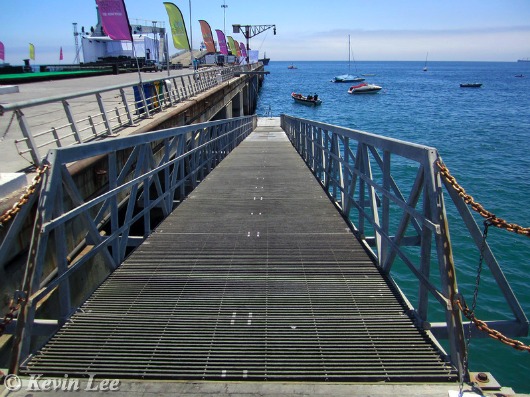 Muelle Baron Pier, ramp to floating dock, where we board a dive boat. Our maximum depth was 12m. Due to the relatively shallow waters, surge was a constant annoyance and visibility was barely 2m, hardly ideal conditions for underwater photography. Still, there is plenty to see on the pilings, which are festooned with all sorts of marine life, and amongst them, where huge tractor truck tires, half buried in the sand, provide ideal hideouts for various fish, unique crabs, anemones and other unusual life. At our second site, I dived solo as Ramon was busy managing a group of student divers, executing their final "deep dive" requirement to obtain their scuba open water certifications. The students’ faces beamed with enthusiasm and excitement, although vaguely shadowed by a touch of anxiety, which reminded me of my first time diving years ago in the same ocean, thousands of kilometers north, in Southern California. Our dive was on the wreck of the Caupolican, an old tug boat that now rests at 21 meters at the bottom of the Valparaiso Bay. My dive buddy, Leo, explained that the tug had been helping a larger ship, to which it was lashed, navigate the harbor. After the tug’s assistance, the larger ship mistakenly believed the smaller boat had untied, cleared and moved away. Alas, the larger ship made a sharp turn and collided with the tug, which capsized and sank, becoming a watery grave for some of the unfortunate crew. In order to take advantage of the wreck undisturbed, I did a giant stride off the dive boat, well ahead of the students who were still gearing up. Ascending to the wreck, a feeling of tranquility greeted me and the peaceful silence was only interrupted by the occasional sound of my breathing and exhaled bubbles. The wreck is covered with a thick carpet of bryozoa and algae. 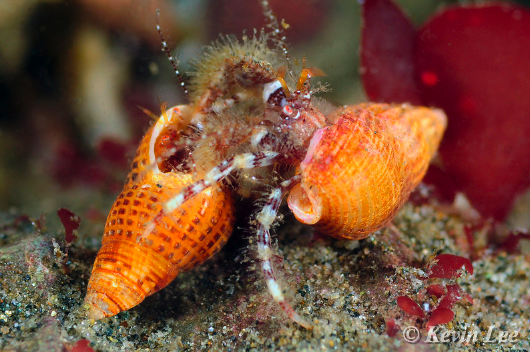 The wreck provides a safe haven for numerous fish and many invertebrates, including several species of my favorite subject, nudibranchs. The water temperature was 11 ºC (51.8 ºF) and the visibility was generally 10-15 meters, until the students came down! A large seal buzzed me and the students were very excited by the encounter. In the distance a large fish, perhaps 1 meter long, approached slowly, turned and swam away. 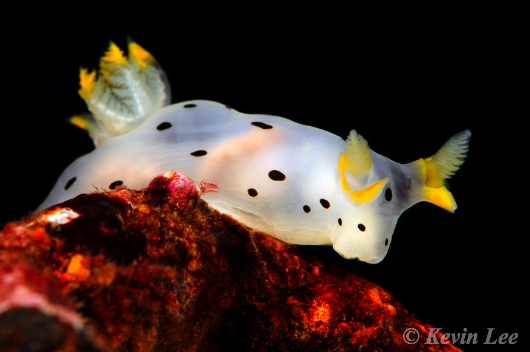 Thecacera darwini species nudibranch at the Caupolican wreck. 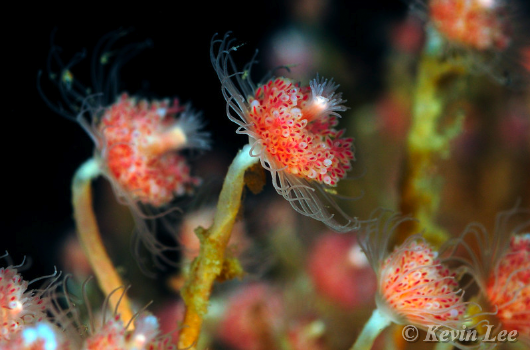 Hydroids, Tubularia species, Caupolican wreck. 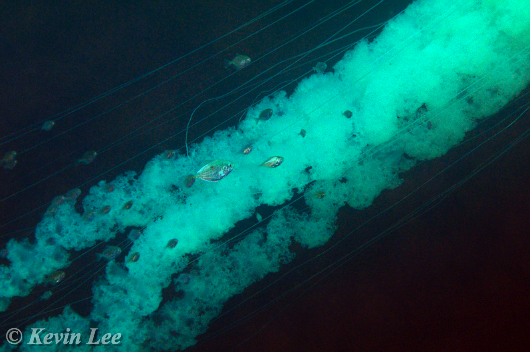 During my safety stop, large jellies with long tentacles gently pulsated by, accompanied by a drifting parade of strange pelagic invertebrates. 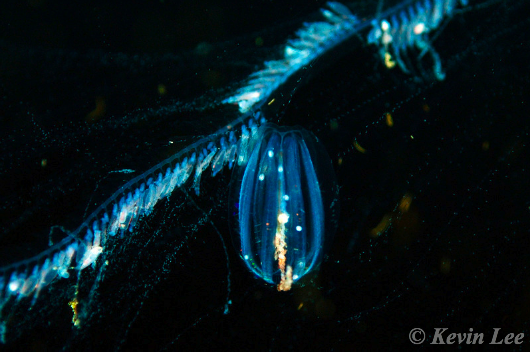 Ctenophore, Pleuribrachia species, above the Caupolican wreck. 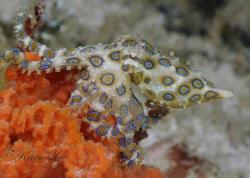 Fish find protection in jelly tentacles, Caupolican wreck. Upon surfacing and re-boarding the dive boat, the atmosphere was cheerful and enthusiastic. Apparently all the students had passed their deep dive requirement and were now freshly minted, certified divers. We all toasted the happy event by drinking champagne from our scuba masks.